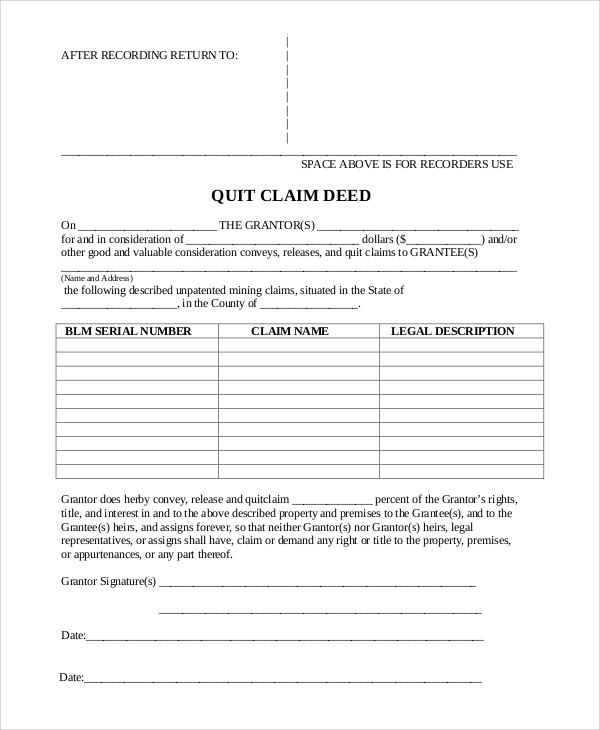 The quick claim deed is what you should use to transfer interests from the grantor to the grantee. The central concept is the transfer of interest, which makes the deed helpful in relieving one party from all interests and liabilities of a property while the other who gets the new liabilities of interest and ownership, gets so entirely legally. Get ideas for various types of quick claim deeds and the Sample Warranty Deed Forms from the template banks. 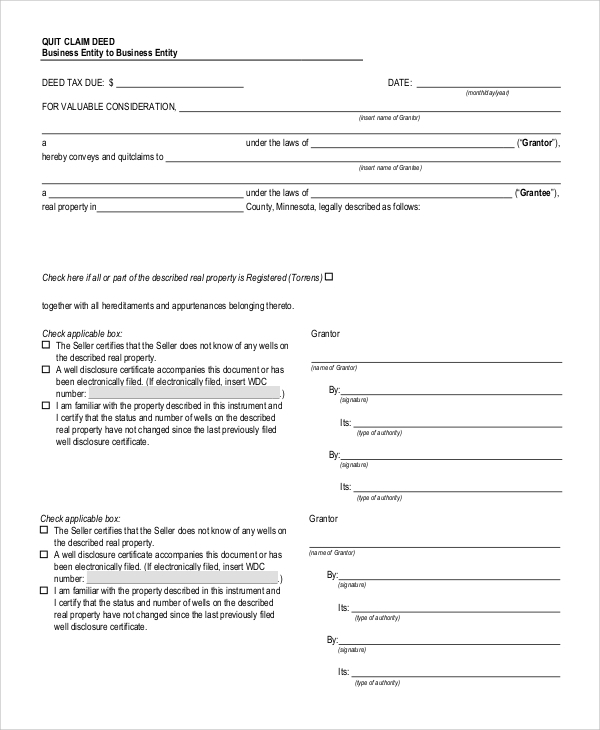 The free quick claim deed form is one of the best formats, and it is downloadable for free, and you can make any general quick claim deed by using the form. 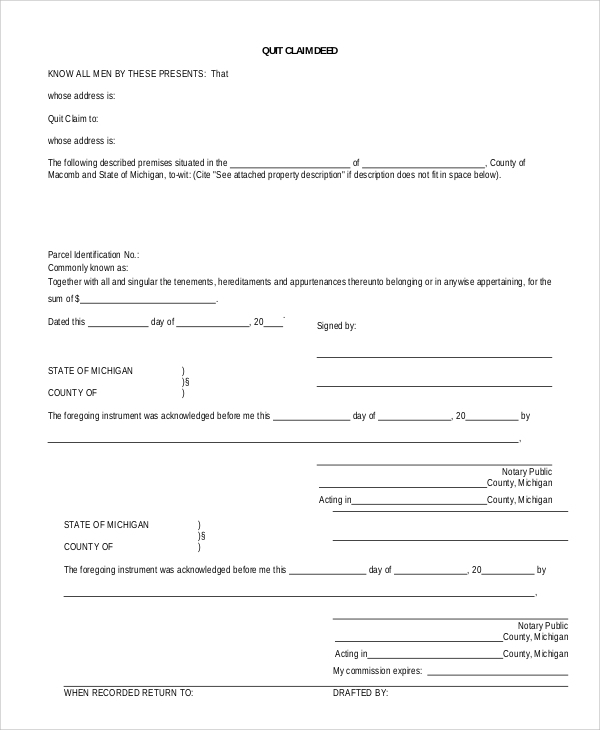 If you are planning to make a quick claim deed for property ownership change and modifications in the liability with interests, then this is the right form and format that you should refer to. 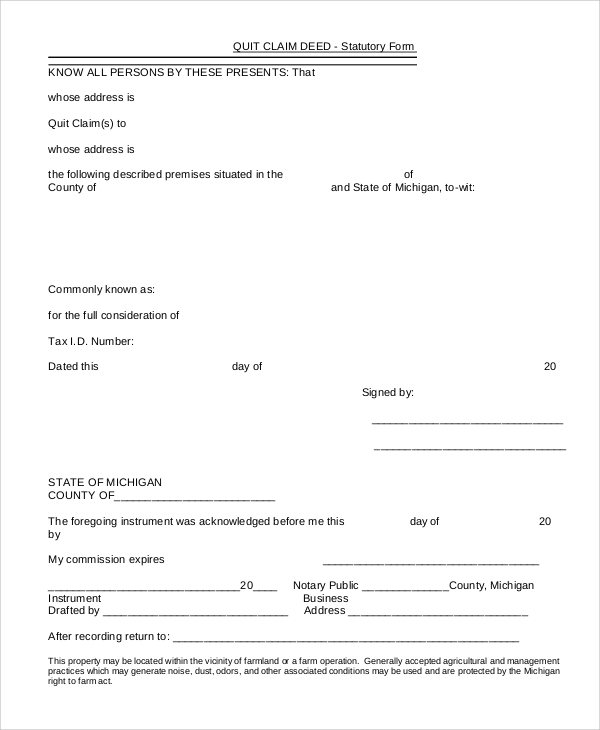 The basic quick claim deed form is made in a way, that the nominal and mandatory fields that need to be present, are only included. The form is not unnecessarily lengthened and kept simple. The printable quick claim deed form is a right pick for you if you want to print the form straight away and need a quick form format. You can make further customizations before printing. 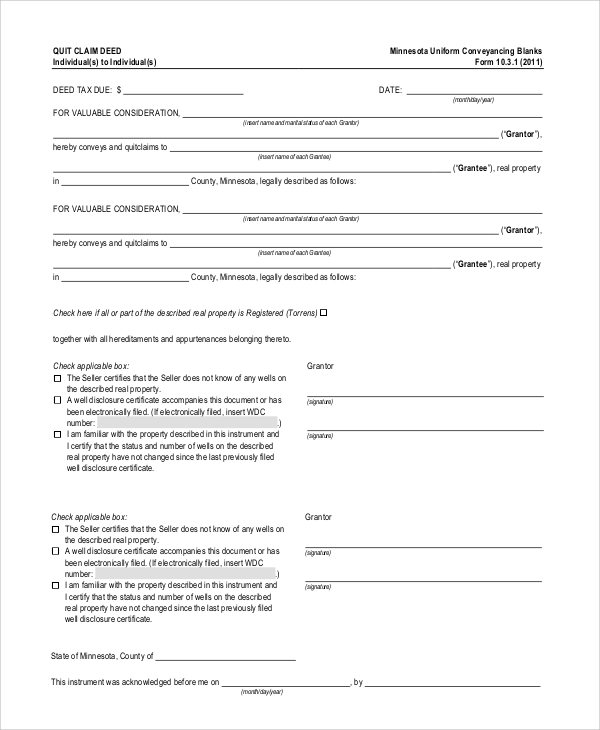 The quick claim deed blank form is one format which you can download and get the must required blank fields, which you need to fill up to get the form completed for your use. What Is A Quick Claim Deed Form? 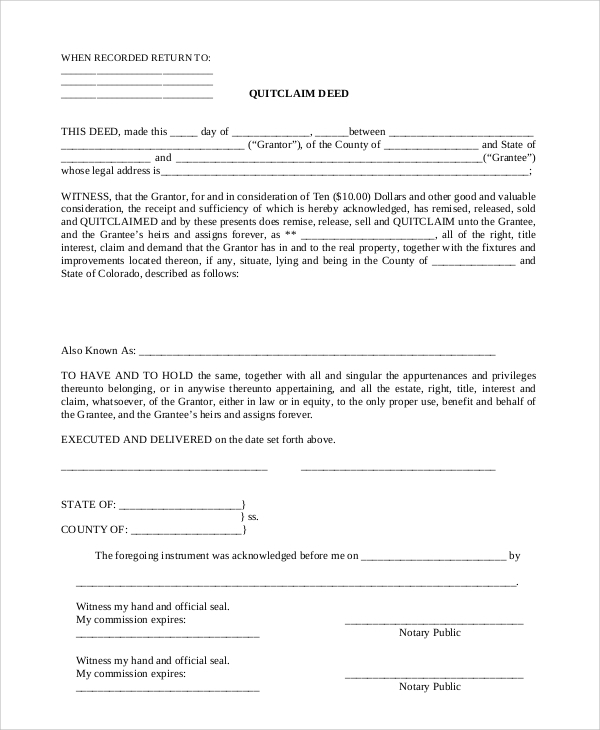 A quick claim deed is one form of legal document which can be used when one party uses to transfer all rights and interests for a property from the first party or the previous owner to the second party or the new owner. Sometimes such Quick Claim Deed Samples are also prepared in case of the right of ownership management when the second party has not bought the property entirely but yet may get a transfer of rights due to some internal understanding between the parties. With the preparation of this deed where both parties will have their consent, the rights get fully transferred. One may also choose selective transfer rights and then needs to be mentioned in the deed. 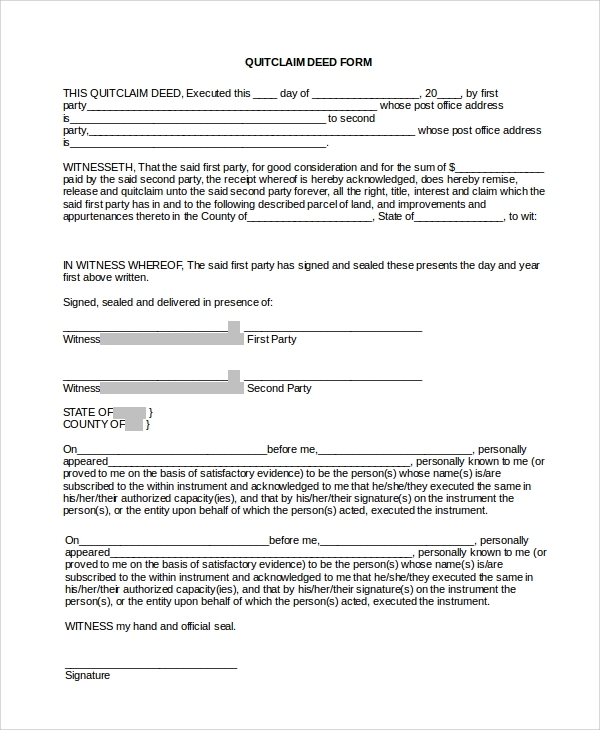 A quick claim deed is mainly useful in handling of disputes which may arise later after a property deal is made, especially in the case of pre-owned or used properties. When the rights of interests, mortgage payments, etc. are transferred, and the company associated with the property still don’t get any intimation of the same, then the deed acts as a proof of the transfer of rights, and in proving the new owner and liable person. Hence, the quick claim deed is particularly useful in settling legal claims, and clearing off confusions. 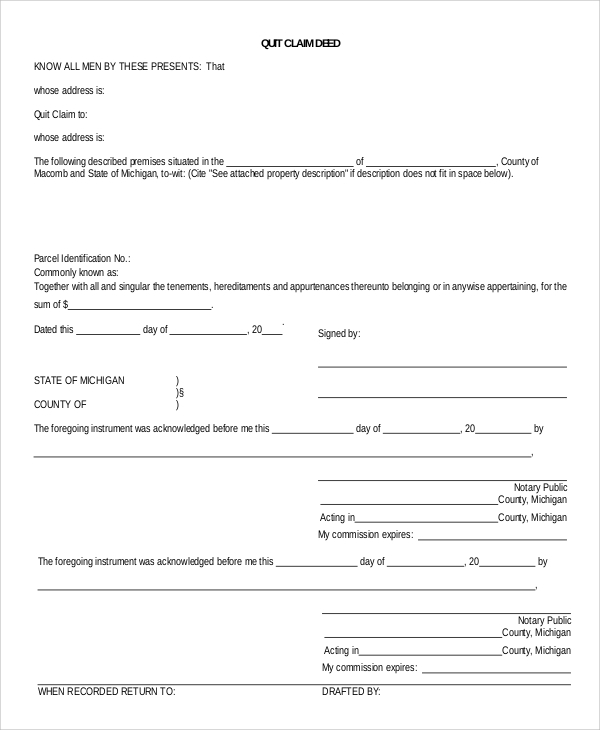 Whether you are looking for various formats of quick claim deed samples or the Warranty Deed Form Templates, they are available in great variety and formats that are easy to customize and print from the online template banks. You may use them for free, and clear off all doubts by referring to these legal document formats.